Dangerous goods are articles or substances with properties hazardous for health, safety, property or environment which are listed in Technical Instructions for the Safe Transport of Dangerous Goods by Air (ICAO Doc 9284 AN/905) or classified in accordance with the same Regulations. Dangerous goods are forbidden for air transport for security and safety reasons, unless otherwise defined in ICAO/IATA Provisions for Dangerous Goods Carried by Passengers or Crew. 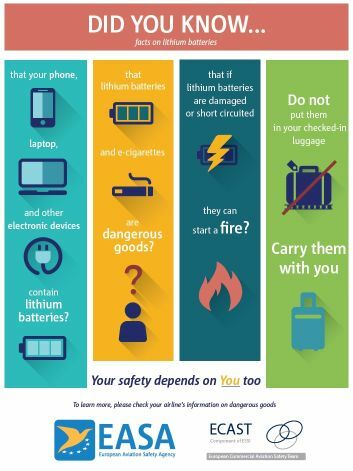 Basic aim of this information is to develop awareness of passengers about danger related to lithium batteries and portable electronic devices which use lithium batteries. Lithium batteries limitations for portable devices and medical portable devices allowed to be carried on board of aircraft by passengers, are expressed in watt-hours (Wh) for lithium ion batteries, or in lithium content in grams (g) for lithium metal batteries. Watt-hour rating exceeding 160 Wh is forbidden for passenger air transport. Over 8 g of equivalent lithium content is forbidden for passenger air transport. Air carriers, as well as some states, reserve the right to deny transport of certain dangerous goods, in the interest of security and safety of air traffic. For any further information, please contact your air carrier, at least one day before the date of travel. Baggage taken into aircraft. Airline determines weight and volume of hand baggage. Fire arms and other objects which may fire off missiles and cause serious injuries. Sharp / pointed objects with cutter or sharpened point which can cause serious injuries. Tools which may be used for serious injuring or for aircraft safety threats. Blunt objects which can cause serious injuries when hit with them. Explosives, flammable items and devices which can cause serious injuries or aircraft safety threats. In order to protect air traffic passengers, EU introduces a limit concerning amount of liquids allowed to be carried in hand baggage, in the year 2006. These protective measures are applied at all EU, Norway, Iceland and Switzerland airports, and are also mandatory at the Republic of Croatia airports. The liquids include: beverages, oils, perfumes, lotions, gels, mixtures of liquid and solid contents, containers under pressure such as shaving foams, gels, deodorants, perfumes and other items of similar content. Only liquids in individual packages of up to 100 ml or 100 g volume, put in transparent, resealable plastic bag, may be carried inside hand baggage. Maximal bag volume is 1 litre. Bag must be completely closed (see picture). Carry inside hand baggage liquids used during flight for medical purposes, or for special nutritional needs, including baby food. At request of person in charge, passenger shall prove the need to use them. If passenger flies from any EU airport to Republic of Croatia destinations, on direct flight or with transit at some other EU airport, he can carry on board liquids (drinks, perfumes …) bought in shops which are behind Boarding Pass Control and / or Security Check. Liquids purchased in that manner must be put in transparent plastic bag (STEB). In the year 2008, EK 820/2008 Regulation came into force, according to which air traffic passengers, flying from Croatia and with transit at some EU and Switzerland airport, are again allowed to carry liquids into aircrafts, provided that they are bought in airport Duty Free Shops, after Security Check and Boarding Pass Control. This Regulation refers to Dubrovnik, Split, Zadar, Rijeka, Pula and Zagreb airports. Stated permission is valid for goods purchased within 36 hours of transfer and packed in transparent plastic bag (STEB). Bag must be sealed, so that any attempt to open it and affect its content must be visible. Take off coat and / or jacket that will be checked as a separate piece of hand baggage. If you have any additional questions please contact your airline or travel agency. Please submit request for excess or special baggage through your airline reservation system. The request will be confirmed according to airline limitations and availability and charged in accordance with airline charges rules.